According to a recent Google study, more than half of mobile visitors will leave if the website takes longer than three seconds to load. 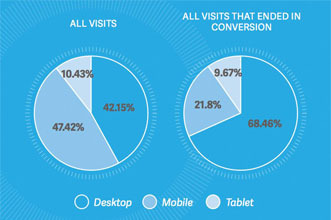 And one in two mobile visitors expect their page to load in less than two seconds. This is especially important to the e-commerce and advertising community who rely on image-heavy content to drive many of their conversions and sales. In fact, mobile sites which load in only five seconds earned almost twice as much mobile revenue compared to ads which had site load in 19 seconds. Also, speed is even more important to the mobile users compared to desktop or even tablet users when it comes to abandon rates. According to SOASTA’s benchmark study, almost half (47%) of all consumers shop via their phones. However, only 1 in 5 complete transactions on mobile, whereas on tablet and desktop there is a significantly lower abandon rate. Test your site and image speed: Use our demo. Optimize your images: If you use a single image size, typically proportioned for a full desktop, then the image is larger than it needs to be for mobile. The result is a large payload. Pages and images load slowly, it is expensive for your users, and it drains their battery. Improve your breakpoints: If you have responsive images, then you need to pick the breakpoints beforehand and create an image for each which can be extremely painful. This often means more work for the editor and web developer. Further, you’ll need a polyfill to make sure responsive images will not fail on some browsers. Target image compression issues: Manually resizing images with multiple breakpoints can be a tiresome process that frequently does not yield with the optimization you want. Instead, use a real-time dynamic resizing service like ImageEngine. Create one master image. Point ImageEngine at it and it will automatically detect devices, compress images, and deliver fast.